Whether raising a child (it takes a village), winning the Super Bowl (team effort), or building a bridge (you’re only as strong as your weakest link), the common thread is the joint action or endeavor involved. By the time a singer basks in the applause acknowledging a job well done, a number of people have been involved in the process. Some of these people are obvious: the voice teacher, a vocal coach, perhaps a manager. Other partners might provoke a new way to look at potential assistance: the executive coach, the Feldenkrais practitioner, the publicist, the recording/sound engineer. One thing is sure: No one lives in a vacuum (No man is an island). Despite the clichés associated with this topic, through networking and alliance building, through trust and transformation, through trial and error, singers need to build a team around themselves. Singers recognize the need to call upon the expertise of others, and they identify those whose expertise matches their own needs. They make contact with these people; ask, learn, implement. They establish a plan. This is how they form a team. During the course of my career, I have worked as vocal coach and assistant conductor, given master classes, participated on panels, led the casting practices of a level one opera company as director of artistic and music administration for 11 years, and now serve as an artistic advisor and consultant. As someone who has been on both sides of the table, I have observed both the triumphs and mistakes of singers as they navigate the often turbulent waters of an operatic career. As your own team develops and forms, and as you continue building your life and career as an opera singer, remember that there is no single way to pursue a career, and that you are uniquely qualified to determine how you proceed. However, there will most likely be obstacles along the way of one kind or the other. I am not one to kiss and tell, so the observations and stories in my article are an amalgam of experiences. If you are a singer with whom I have intersected in the past, rest assured that your secrets are safe with me. The obstacles when forming a team often seem insurmountable, but with the right mix of luck, skill, ability, and talent, you will find the winning combination for yourself. One of the preliminary obstacles in forming a team is knowing who to put on your team. As a young singer, your reservoir of knowledge is still filling. How do you know if you have found the right voice teacher or the right coach? You could be influenced by someone who does not hold your best interests at heart, or put your trust in someone who is not trustworthy. How many times do we hear, “He/she did not help me, but he/she did not hurt me?” Or, “It took years to resolve the technical difficulties caused by teacher X.” Most singers I know, over time, fill their reservoir enough to make choices for themselves and either move on to someone else or say a heartfelt thank you to the earlier (or current) musical and vocal influences in their lives. During the time of team formation, one of two things might happen. Sometimes, too many people are put on the team and good advice is diluted or contradicted. I have often said in master classes or post-audition feedback forums, “I have witnessed a small slice of your vocal and musical life. This is what I heard today.” Too often singers change fachs, repertoire, or teachers based on advice following a ten-minute impression. Listen to all the feedback, but put it into the context of your musical journey as a whole. You know the old adage: Too many cooks spoil the broth. Alternately, it may be very difficult to get anyone to pay attention to you. The studio of a desired teacher or coach might be full. Your hoped-for manager is not accepting singers of your fach. The company you feel will be the perfect fit for you is hearing only managed singers. The young artist program that you want to get into will not give you an audition. The possibilities go on and on. Perseverance and a continuing positive attitude are key. A personal recommendation might help you overcome the obstacles. Even then, you might not get a response in a manner you consider timely. Your timeline might look like this: Day one: Mail/e-mail/call/leave message/fax request to desired contact. Day three: Expect a response to your communication. Day five: Start to get anxious about recipient receiving message or letter. Day seven: Try again. Your timeline might be realistic for you, but for the person you are trying to contact, it is usually unreasonable. Correspondence of any kind is often opened or answered (and prioritized) by an assistant. The opera company may be in production, the manager out of the country, the teacher or coach fully booked from 9:00 a.m. until 9:00 p.m. It might be awhile before they get to anything that is truly not urgent. And remember that “urgent” means urgent to them. Everyone has the best intentions, but people get very busy in this business. No one intentionally disregards or disrespects a singer by not following up on the original contact. Knowing when to persevere and when to back off is helpful. It can be a sixth sense or a skill set in your reservoir. Or it can be the advice of someone already on your team whom you trust. Another obstacle to team formation is assuming that others will do your work for you. Sadly, I have known too many singers who, upon signing with management, sit back, relieved that their manager will hustle on their behalf. They do. But they still need you in this pas de deux. Talk with your manager and make a plan about how the two of you can move your career forward together. When forming your team, please do not lie. Not even a tiny fib. Not even stretching the truth a bit. This could be one of the biggest obstacles of all. The opera world is small, and with e-mail, it is a country village. If you sang a bit part in an opera, indicate it as such. If you include that company in a list of “Mr. X has sung leading roles with the following companies,” you will lose your credibility. I can guarantee you that people call around and ask colleagues about singers: Were they prepared? How did they perform? How was their rehearsal etiquette? Were they late to rehearsals? Were they consistent? Did they sing a performance or did they cover only? Did they really sing there? Will you hire them again? Why or why not? Let’s not forget the audition condition. It is likely that you will need to audition more than once in your lifetime. Most people perform better than they audition. There are those lucky enough to have the skills for performing an audition. If this is not in your tool chest, buy it. You will most likely need to audition for many years to come. Let this obstacle be the mountain you learn to scale with ease. One word of advice: Do not practice auditioning by actually auditioning for companies. Make sure your skills are honed in classes or in the studio. I have heard of some clever singers in my city who get together to sing for each other. Create opportunities for yourself before you sing prematurely for a company and get a DNRH (do not re-hear) stamped on your resume. Money, sadly, is also an obstacle. Almost everything costs money. 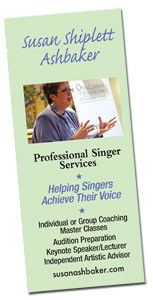 Voice lessons can run between $50 – $150, depending on where you live and with whom you study. Experienced coaches can cost between $50 – $100 per session. Add to that language coaches, drama coaches, body work, head shots, and you are looking at thousands of dollars. I know singers who have bartered for services. Many are obligated to hold onto day jobs or temporary jobs until their singing brings in a living wage. Once you have survived the formation of “team you,” you are set up for smooth sailing for the rest of your career, right? I wish! You might be incredibly lucky, but there are usually some more obstacles that line the path to your vocal fame and fortune. The grass is greener on the other side, isn’t it? You may get frustrated with a team member and want to scurry off to another teacher, coach, or manager. Before you jump ship, really assess your situation. Sometimes change is exactly what is needed. Often, however, singers become disillusioned with the new teacher, coach, or manager as well and realize that they were better off before the switch. Use your reservoir of knowledge to make a thoughtful decision and in the process don’t burn any bridges. Which brings me to burning bridges. In a word, DON’T. As I said earlier, our field is small. You never know if audition monitor X or aggravating singer Y is going to someday run company Z. You certainly do not have to like everyone with whom you work, but be a pro and learn how to get along. Poor behavior is remembered as long as and often better than good behavior and could cost you many a job. Let’s assume you are a consensus builder who arrives well-prepared, on-time, in a sunny disposition, and ready to work. But “team you” is bubbling with dissention. Your beloved team members do not agree on an issue (or several). Racing to arbitration or mediation is not usually the solutions. Neither is pulling the ostrich trick of sticking your head in the sand. As CEO of “team you,” you need to make the final decisions. Is it in your best interest? If you know your strengths and weaknesses and have set goals for yourself, you will, most likely, know the right course of action despite disagreement among your team members. Most of the time, you will be able to reason with and explain to team members who are unhappy about your choice in a win/win manner where, while they might disagree, they respect you none the less. Remember that you chose these advisors, often as your career is just forming. It is great if you can maintain these relationships. Sometimes, however, that is not possible. Try to part ways amicably (remember, no burning bridges). Like most exes, whether they remain good friends or keep their distance, they were part of your past and helped you (for good or bad) become who you are today. Be especially cautious of yourself if you can never find team members whose advice is aligned with your instincts. Your own expectations, readiness, and ambition might be skewed. So many singers have shown great potential only to tank after five years or so because of one mistake after another. Do not be so anxious to build your career that you listen to no one, sing roles too soon or incorrectly, and fizzle out. A few other obstacles when managing your team warrant comment. If you are being double-booked, someone will be angry when you either do not show up or show up late. In this great age of technological advancement, double-booking is happening less frequently, but managing your team means keeping track of this. If you start getting vocal advice from too many sources, you need to evaluate the situation. Ask yourself if your team members are offering helpful hints to steer you away from potential problems or crossing the line. By having a handle on your vocal strengths and weaknesses, you should be able to discern what is right for you and put a stop to (or thank) the advisors. If a team member becomes too controlling, watch out. There should be free and honest flow of information in both directions regarding your career. Remember, you are managing the team. Do not allow yourself to be put in the position of following your team. You also need access to your team. Are they communicative? Do they respond to you in a timely fashion? Do they help you create solutions and strategies? Or are they continually inaccessible when you need them the most? One final obstacle: managing your team falls entirely on your shoulders. While a CEO of a Fortune 500 company may leave her or his office and get away for the evening or weekend, you carry your product with you everywhere you go. That is a blessing and a curse. What a gift you are given as a singer! But how difficult it is to escape the dangers of living: getting caught in the rain or snow without proper clothing, cheering your sports team on, staying out too late, sipping an extra glass of champagne, even coughing. Try to find a balance and have a life away from singing. It will make you a well-rounded person and ultimately, I believe, happier if there is more in your life than two vocal folds. We all have periods where we are myopically focused on career, but remember to stop and smell the roses along the way. As your own team develops and forms, and as you continue to build your life and career as an opera singer, remember to listen to yourself, listen to your team, listen to your friends and family, and listen to other singers. Distill what is true for you and make it your own. There are many people out there hoping you will succeed. There are many people who will help you achieve your goals. There are many people who will offer advice. Is it in your own best interest? If so, jump on it! Sing it! Live it! Life is not a dress rehearsal. It is the performance. Do not miss it!